I am pretty sure I have mentioned that my apartment sits just meters away from Rue Faubourg-St. Honore, which is known to be quite the high-fashion and high-dollar (or “high-euro”) shopping mecca. 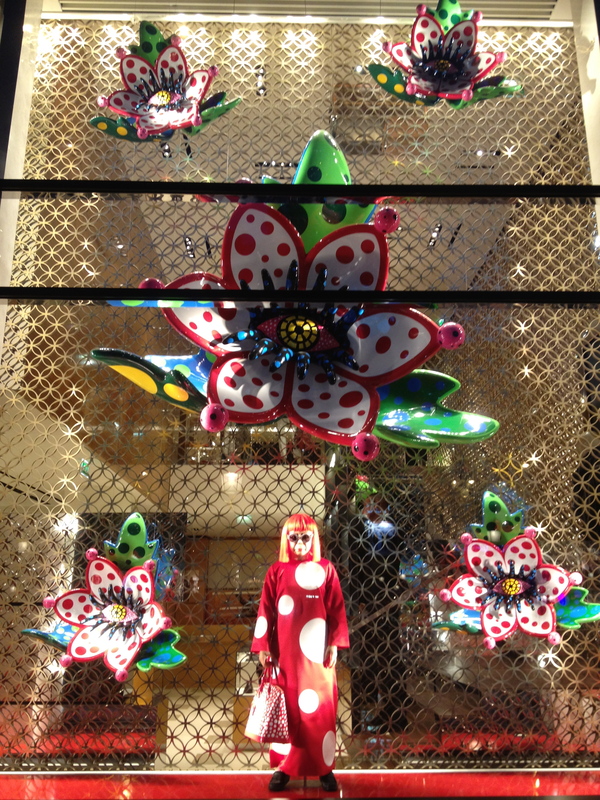 I enjoy the street for its fabulous store windows, which I rarely venture beyond. When I returned to Paris at the end of August, I was eager to see what the new window candy was on one of my favorite walking streets. You know I am not the best at capturing store windows without glare or my own very un-glamorous reflection, but here are a few of my recent attempts. 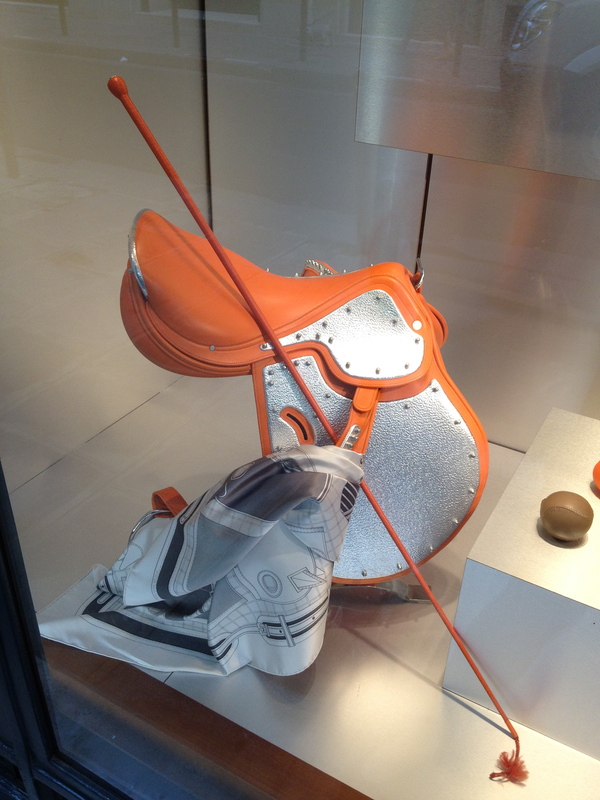 The current Hermes windows are not nearly as breathtaking as the rotating color wheels that were there when I left in the summer. They have shimmery, metallic-y , glamorous fabrics hanging as a back-drop, and then various Hermes fabulosities in front of them. I thought they were kind of “meh”. 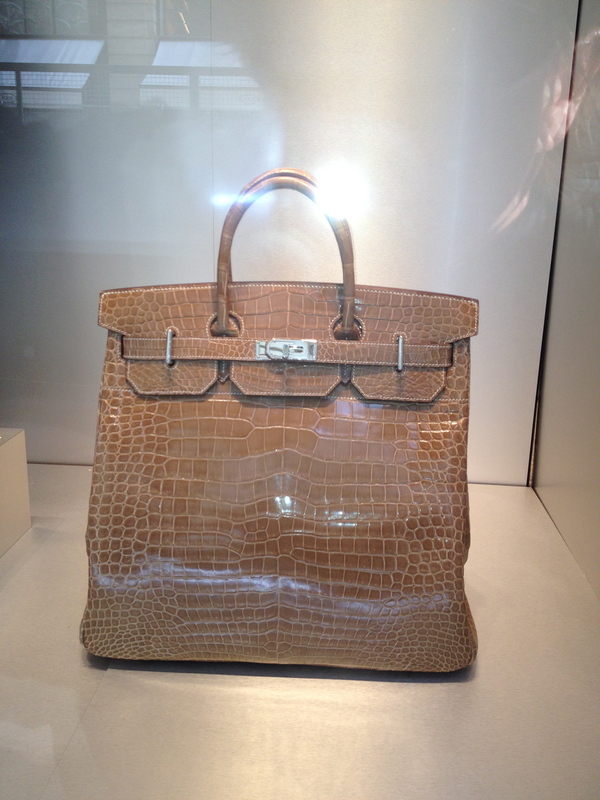 This crocodile bag was 30,000 euros. LOVE the color of this saddle. 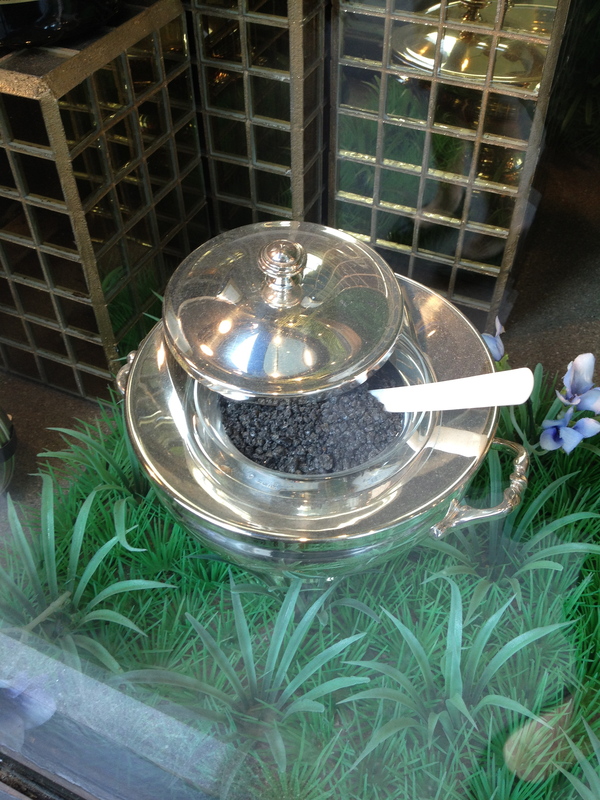 A bit farther down the street was a window displaying champagne and caviar. 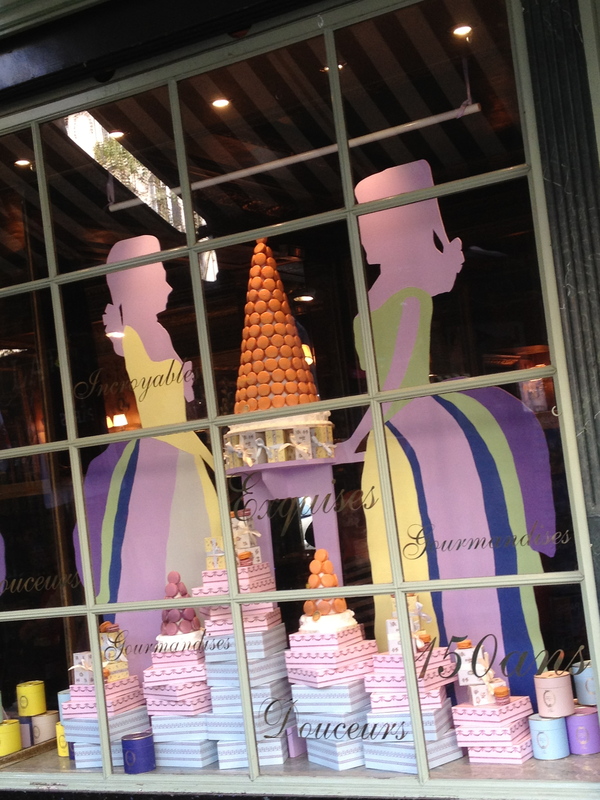 And of course there is Laduree, which is celebrating its 150 year anniversary. 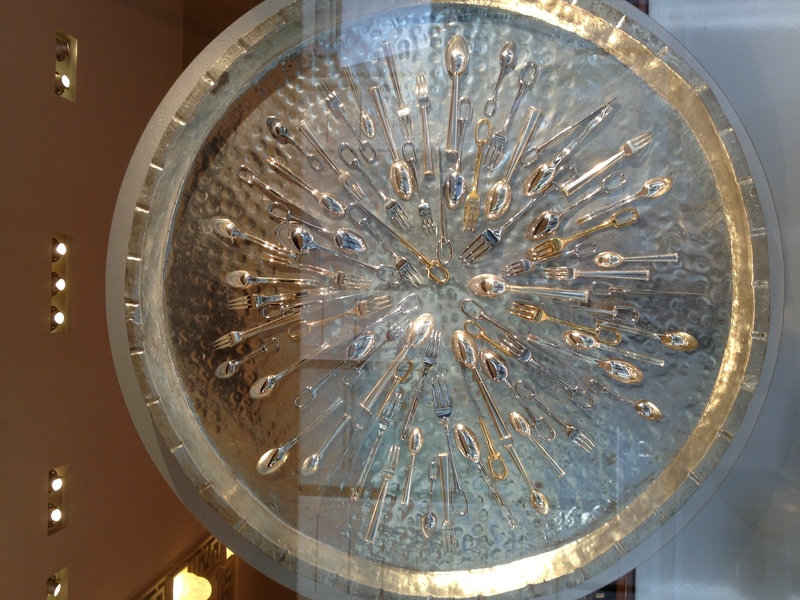 Macarons are not really all that “luxe”, but this Laduree store drips with elegance and their windows are always creative. Finally, we close with the always elegant Louis Vuitton. These windows are kind of creepy, actually. 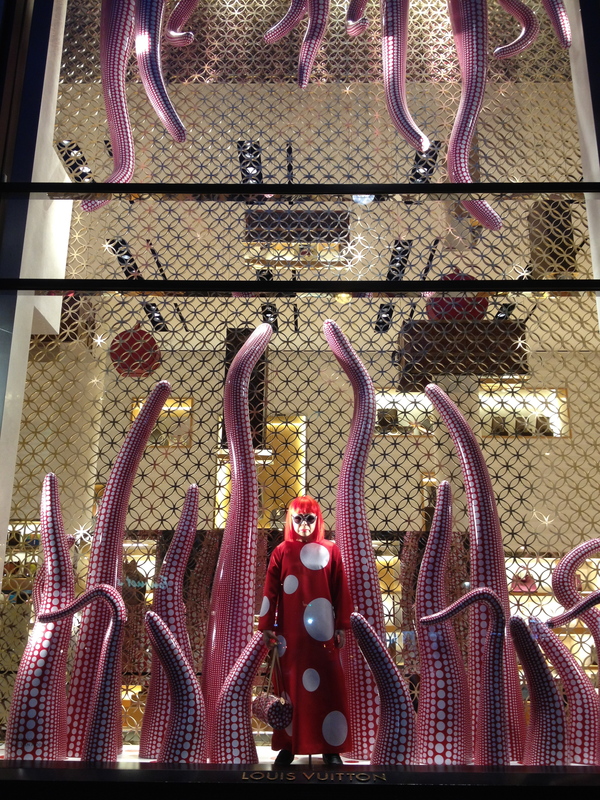 Octopus legs and giant eyes and mannequins that look startlingly real. Any guesses on what they are selling here? I hope you enjoyed a bit of luxe for lundi (“Monday”, a francais). And just so you know, I am spending my Monday wearing an apron, mopping, cooking, and ironing. Keep it real, mes amis! 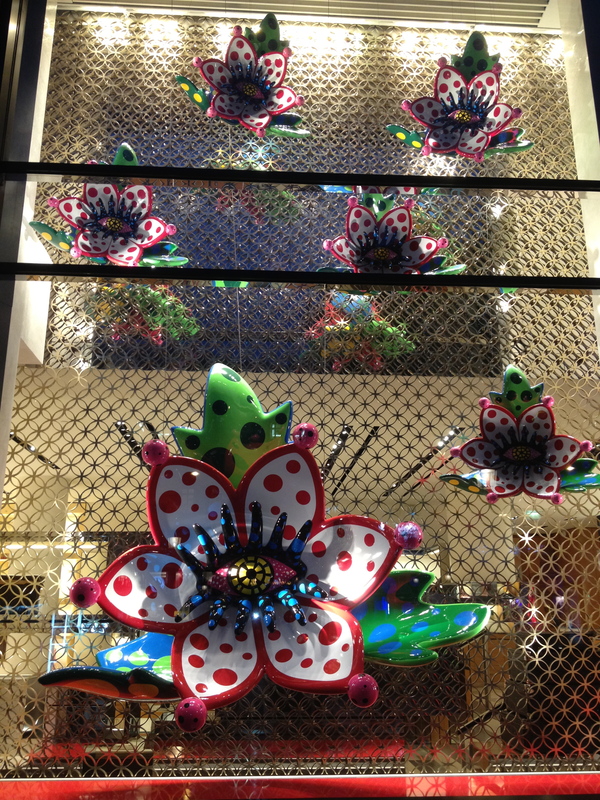 LOVE the LV windows even though they are a little crazy looking – they remind me of willy wonka. They definitely are not as pretty as last spring’s though – I think the best campaign LV has ever had was the carasouel. But please assure us that you are mopping, cooking, and ironing with your Hermes scarf jauntily tied about your neck! Kate, think the windows are a tribute to the Japanese artist Yayoi Kusama – happened to see a snippet about her on CBS Sunday morning. Here’s the link to her documentary: http://kusamadocumentary.com/. Who says watching tv doesn’t enrich your life?